On International Women’s Day, a lawsuit dropped that sent a shock wave through the world of soccer. On International Women’s Day, an earthquake was felt throughout the world of international soccer. Just three months before the Women’s World Cup in France, 28 players on the dominant US women’s national team filed a federal class-action lawsuit in the United States District Court in Los Angeles against the United States Soccer Federation. They are suing the USSF for “institutionalized gender discrimination,” claiming that the USSF is in violation of the 1964 Civil Rights Act. They are fighting for pay equity with their male counterparts. While the timing of International Women’s Day and the lead-up to the World Cup certainly adds a certain cinematic drama, the lawsuit is a follow-up to a March 2016 charge levied by star players Carli Lloyd, Alex Morgan, Megan Rapinoe, Becky Sauerbrunn, and Hope Solo with the Equal Employment Opportunity Commission (EEOC). Those EEOC charges have dictated the timing of the coming suit. Lloyd, Morgan, Rapinoe, and Sauerbrunn received right-to-sue letters from the EEOC just last month, a necessary step under federal law to take Friday’s action. These players are more than a murderers’ row of a squad, ranked the number-one team in the world in 10 of the past 11 years. This is a political and politicized group of players. 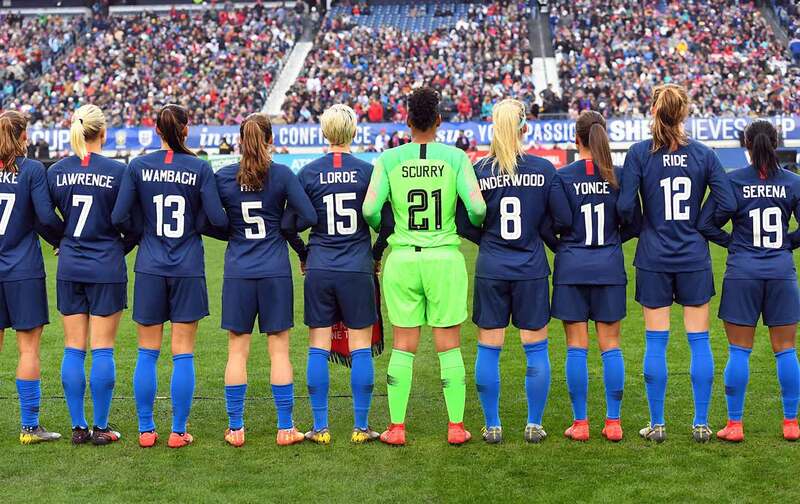 Days before the lawsuit, they took to the pitch with the names of women of inspiration on their back, including Audre Lorde, Sojourner Truth, and Malala Yousafzai. Megan Rapinoe honored Audre Lorde, the legendary writer and self-described “black, lesbian, mother, warrior, poet.” Folks may also remember Rapinoe from when she took a knee in solidarity with Colin Kaepernick during the anthem in 2016. Rapinoe spoke to CBS This Morning from France, where she and teammate Alex Morgan unveiled their World Cup kits. The USSF argues that the men bring in more revenue, but that is hard to fathom, given that the men did not even make last year’s World Cup, while the women played in a final against Japan—where they won 5-2—in 2015 that garnered higher ratings than the World Series and the NBA Finals. Common ground may be reached, but the players’ goal is higher ground: higher ground achieved through struggle. The US women are going after something much greater than another World Cup triumph. They are going for a legacy that will elevate women’s soccer players, women athletes, and women for generations to come.